* This HDMI audio extractor has one HDMI input, one HDMI output, one Optical SPDIF output and RCA L/R stereo audio output. * The HDMI output has identical video and audio signals as the A/V signals coming into its HDMI input. "* 2CH Mode: It can extract digital 2CH PCM stereo audio signal from the HDMI input and convert it to 2CH analog stereo output through its RCA style L/R analog output. The RCA L/R output will not have sound if the incoming audio is multi-channel audio (>2CH). Set EDID switch to 2CH for RCA L/T stereo application. " * 5.1CH Mode: The SPDIF optical audio output supports all audio formats up to 5.1CH Dolby Digital 5.1CH / AC3, DTS 5.1CH AND Dolby Digital Plus "DD+" formats. TOSLINK optical audio output does not support higher formats, such as HD audio (Dolby TrueHD, DTS-HD Master Audio, PCM5.1 and beyond). * Pass mode: SPDIF output audio format depends on the TV EDID. The audio and video can be convertered from the HDMI output. 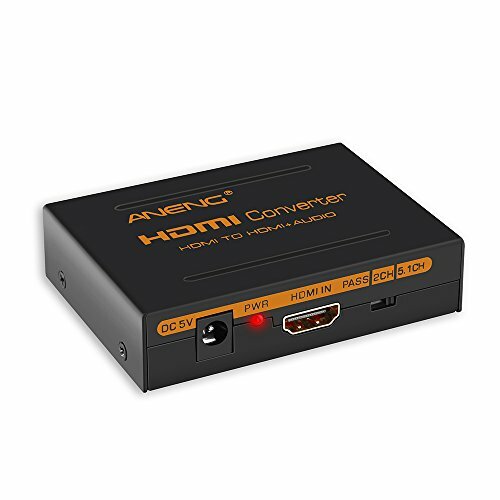 HDMI to RCA audio extractor - ANENG 4k HDMI to HDMI Converter is Porffesional on Audio Extract, it Provide an Extra SPDIF Audio Ouiput and Extra R/L Analog Audio Output, Also it is a Perfect Solution Support 2.1CH and 5.1CH, It can help to improve your sound quality and enjoy the beautiful music world. 4K HDMI Resolution - Up to 4K x 2K@30Hz, Supports Video Color Format 24/30/36bit,No loss of quality. Suitable for various HDMI source devices like Roku or Chromecast without dedicated audio output as well as Blu-ray/ DVD/ HD player, cable/satellite box, Amazon Fire TV, Apple TV, PS3/4, Xbox, PC/laptop, HD camera, HD DVR etc. If you have any questions about this product by ANENG, contact us by completing and submitting the form below. If you are looking for a specif part number, please include it with your message.